HiRISE DTMs are made from two images of the same area on the ground, taken from different look angles. All the stereo pairs acquired so far are available here. Not all of these have been made into DTMs due to the time-intensive process. Creating a DTM is complicated and involves sophisticated software and a lot of time, both computing time and human operator time. The great advantage of a HiRISE DTM is the high resolution of the source images. As a general guide, terrain can be derived at a post spacing about 4 time the pixel scale of the input images. HiRISE images are usually 0.25 - 0.5 m/pixel, so the post spacing is 1-2 m with vertical precision in the tens of centimeters. In order to prepare the images, we must first correct the geometry by removing any optical distortions inherent to HiRISE. Then the spacecraft pointing information at the time of each observation is gathered. Triangulation, also called bundle adjustment, requires the most operator skill and time. The purpose of triangulation is to register the stereo images to each other and to the MOLA elevations. The end result is tied to the global elevation map produced by the MOLA instrument team. This is the same map that you see in the context map pane of every HiRISE observation page. 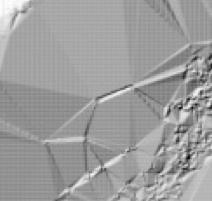 Once the images are triangulated, then the terrain model can be generated. This step is computationally intensive, but automated, so it just takes a lot of computer time. 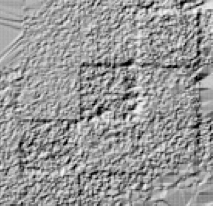 The output of terrain extraction is reviewed for any artifacts or errors. These are edited out if possible. Since editing is extremely time-consuming, it is usually done on easily corrected errors and in the areas of most interest to the researcher. The less editing we have to do, the better, so a lot of effort goes into preparing the images so that the input is as high quality as possible. The excellent contrast and value range of HiRISE imagery usually result in high quality terrain extraction that requires minimal editing. After we have a terrain model, we can make other products, such as orthoimages. An orthoimage is a picture that has been orthorectified. This means that the pixels have been projected so that at each pixel it is as if you are looking directly down at the terrain. In the original stereo images, we rely on the fact that there are topographical distortions (parallax) to derive the elevations in the terrain model. In the orthoimages, all topographic distortions have been removed. Orthoimages are made of the source stereo pair for a DTM. If other images exist that cover the DTM, we can also orthorectify them. The final products are map projected using the same mapping definitions as the regular HiRISE RDR products. For a detailed explanation of the process used to create HiRISE DTMs, see Kirk, R. L., et al. (2008). Researchers use DTMs to take measurements and model geological processes. DTMs are very powerful research tools. There is a long waiting list for these products because they are so valuable and so difficult to produce. HiRISE DTMs and orthoimages are released to the Planetary Data System (PDS) as they become available. Standard PDS products are usually quite large files. The links provided on the DTM project page will download the files to your system. To get a quick view of the DTM or orthoimages, click on the Extras links to see a reduced version of the products, displayed as images, grayscale, shaded relief and colorized elevation maps. images from the same HiRISE observation that may be created from different DTMs. 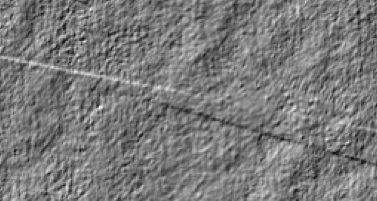 These are known artifacts present in some, but not all, HiRISE DTMs. They may not be present in this DTM! Look at the terrain shaded relief to detect these before using the DTM! Some DTMs have square areas that are usually about .5-1 m different in elevation from the surrounding areas. These are artifacts of the processing algorithms used in Socet Set ((c) BAE Systems). There may be goups of these boxes. These artifacts are usually left unedited, so the user should look for such artifacts in a terrain shaded relief map before using those parts of a DTM for analysis. A HiRISE image is made up of 10 individual images, stitched together along their long edges. 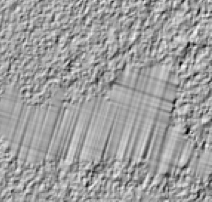 In a DTM, these seams can be visible as long lines. These seams are difficult to remove, and so are usually left unedited. Areas that were very bland (low contrast) or deeply shadowed with low contrast and low signal may have a "faceted" look to them. Terrain in these areas may only generally approximate the shape of terrain. Some manual editing tools result in a geometric pattern due to interpolation from boundary posts. The user should be aware of these and compare the DTM to the images to understand the quality of the interpolation.